We recommend that teeth and supporting tissues be examined every 6 months to maintain good oral health and to keep your smile beautiful. Regular dental check-ups will prevent minor problems from becoming major ones! Even patients wearing full dentures should ensure their oral health is maintained with regular soft tissue exams by a dentist. Simply brushing with a manual or electric toothbrush can’t remove all the plaque and tartar build up that occurs over time. At Angel Dental, we utilise a gentle ultrasonic scaler to remove excess plaque, and polishing discs and paste to remove any food stains from your teeth. You’ll leave our rooms with a big smile on your face after we return your teeth to their former glory. Unfortunately, tooth decay is quite common. 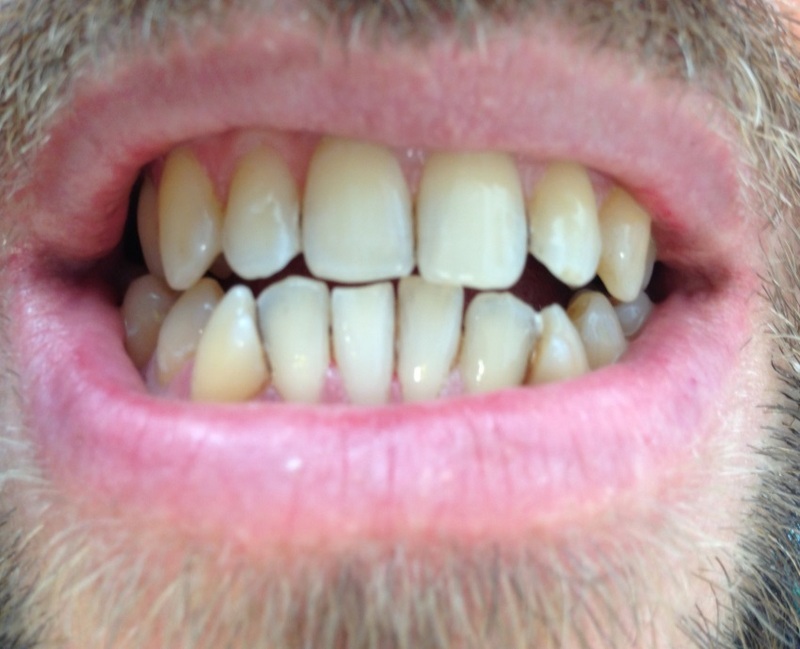 The good news is that this early damage is easily repaired by filling the tooth. The filling not only prevents further decay but stops bacteria from entering the tooth. In the past silver amalgam fillings were the norm. However, they’re not used much anymore. 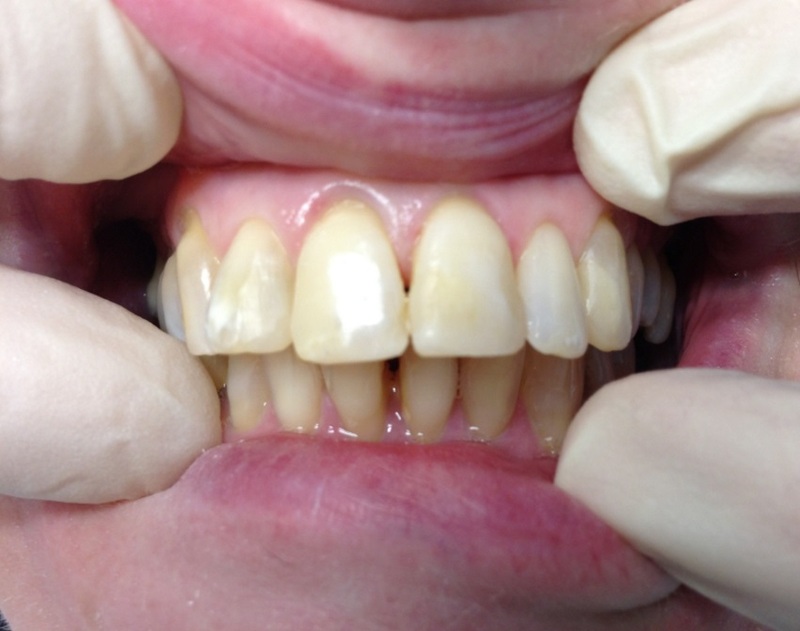 These types of fillings leak and stain the underlying tooth substance a grey/black colour. In addition, they don’t adhere to the cavity, which means dentists force and wedge them into the tooth, increasing the likelihood of eventual cracks and fractures, and further loss of tooth material. Amalgam fillings also contain small traces of mercury. Angel Dental is a mercury-free practice and we ONLY use tooth-coloured filling material (such as composite or porcelain fillings). These fillings, besides looking invisible, adhere onto the tooth, helping preserve tooth structure. They can also be used to provide therapeutic medications into the tooth, reducing sensitivity and recurrent decay. All our tooth-coloured fillings are provided at no extra cost. 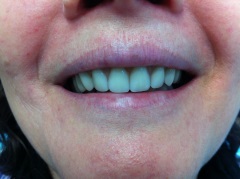 These gorgeous restorations are essentially a porcelain covering for the front surface of your teeth. They can transform your smile by correcting crooked teeth, closing gaps, or simply covering unsightly discoloured teeth. If you’re thinking about renovating your smile, we can show you a personalised model of what your new teeth will look like. Our Melbourne CBD laboratory technicians are very clever! Treatment involves preparing your teeth to accept porcelain, followed by final permanent cementation of the veneers. This can take 2 weeks, or less if the need arises as we are able to prioritise your treatment. During the construction period, your teeth are covered with a tooth-coloured temporary veneer material to protect the underlying teeth, and help you get used to your new look. If your tooth is at risk of fracture, we may recommend a porcelain restoration, such as inlay-onlay, or crown. If a tooth is missing, porcelain can be attached to adjacent teeth to fill the space and your Angel Dentist will be able to discuss the specific design with you further. All of our porcelain restorations are made in Australia by our skilled laboratory technicians. At Angel Dental we take accurate records to enable a precise prescription which is custom-made to your tooth and functional requirements. This achieves a far superior result in furnace-fired and glazed, smooth porcelain. If a tooth is missing, porcelain can be attached to adjacent teeth to fill the space and your Angel Dentist will be able to discuss the specific design with you further. Sadly, some patients may have missing teeth, either due to trauma, infection or complete absence where the tooth never developed. In addition, some patients may require a cosmetic replacement of their existing teeth which also benefits their smile, chewing and confidence. Dentures are artificial replacements of teeth, the supporting bone and gums. They’re designed to be removed for cleaning, are not cemented, and are usually constructed within 3-4 weeks. However, we can arrange for them to be made sooner if the need arises as our denture technician is also based in Kilsyth, greatly reducing transit times. If you’re missing teeth, one solution may be a dental implant. Made from titanium, these implants enable us to replace missing teeth. Implants are surgically inserted into the jaw-bone, and become a direct structural and functional connection between your jaw and the artificial tooth. 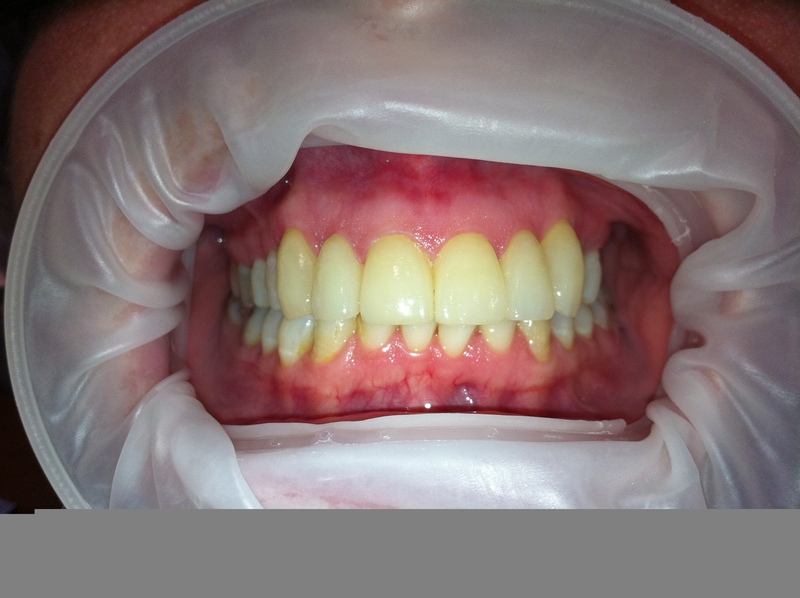 We then attach a crown, bridge or denture to the implant to create a smile that’s both natural and durable. Implants are an extremely successful solution for non-smokers, as they are versatile, adaptable and last many years. Your Angel Dentist will access your suitability for an implant. The success of this treatment will depend upon your level of oral hygiene, available space, and bone level at the proposed implantation site. One of the simplest ways to pep up your smile is to whiten your teeth. Over time, teeth may become discoloured for a number of reasons, including age and wear and tear. However, the biggest cause of stained teeth is what you eat and drink. Drinking red wine, tea and coffee, and eating dark red foods can cause tooth discolouration. Smoking also stains your teeth. Whitening stained teeth is a relatively simple process. Firstly, we clean your teeth to remove any surface stains and calculus. 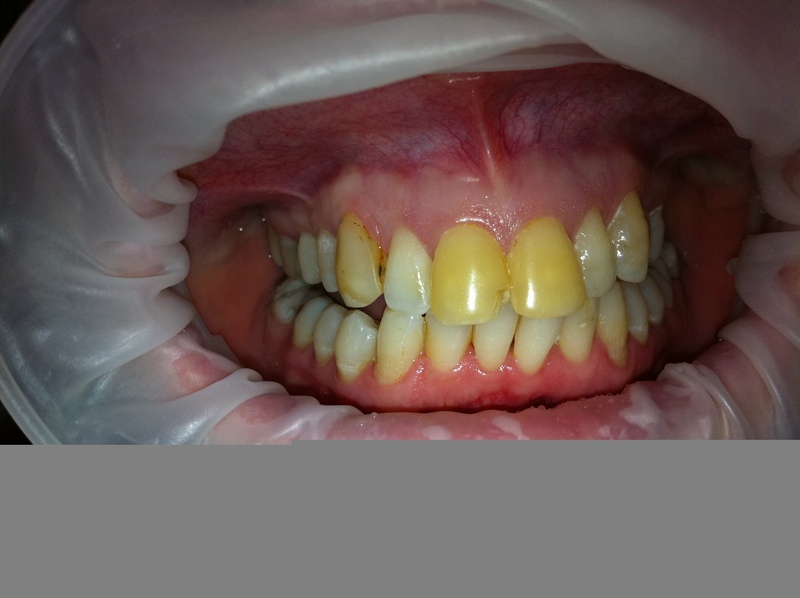 This also enables us to establish the base colour of the enamel. 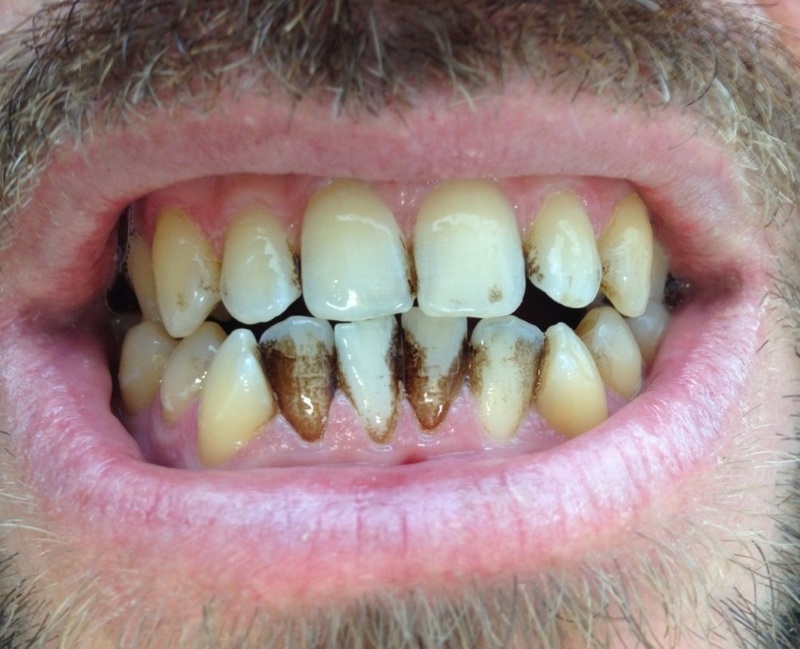 Fortunately, stained teeth respond very well to the bleach that is applied to the outside of the tooth. 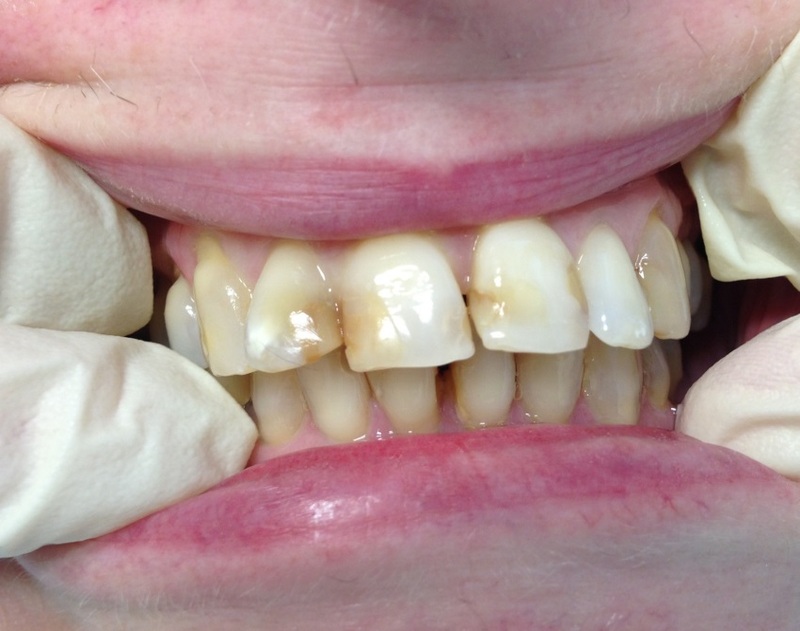 Angel Dentists discourage the use of Zoom whitening due to the degree of severe post-treatment sensitivity reported by patients, both anecdotally and in clinical studies. Instead, we prefer to use gentler applications of tooth whitening materials with minimal side effects. The clinical concentrations of bleaching materials are restricted and only available to dentally-qualified health professionals. This means that over-the-counter bleaching kits bought from pharmacies, or available at whitening sessions, are far inferior and offer little or no value for money. They also won’t remove any surface stains from the tooth. 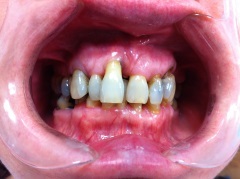 Some whitening companies use alternative preparations which are very caustic resulting in burns to the gum tissue as shown here. OUCH! NOT AN ANGEL DENTAL PATIENT!!! While charcoal-activated pastes remove some surface stains, they are also very abrasive and can cause gradual thinning of the tooth. Sometimes the nerve inside a tooth becomes infected or dies. This can result in symptoms ranging from occasional sensitivity to severe throbbing pain. Left untreated, abscesses can damage adjacent teeth, cause soft tissue swelling, and in medically compromised patients, may lead to life-threatening complications. This situation needs to be assessed and treated by a dentist. If a root treatment is required, the infected nerve of the tooth is removed from the inside of the tooth, along with any decay and replaced with a sterile, flexible filling material. This occurs over the course of a few appointments, while the tissue around the tooth heals. 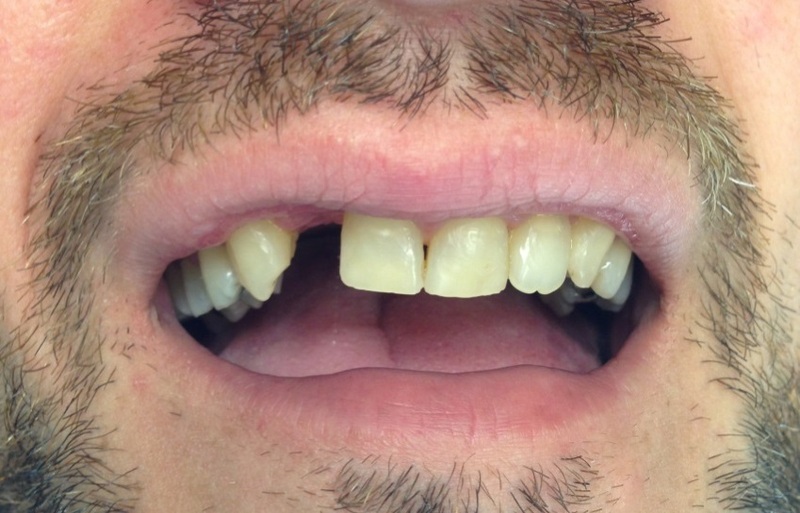 If there is extensive decay in the tooth, a crown may also be fitted.